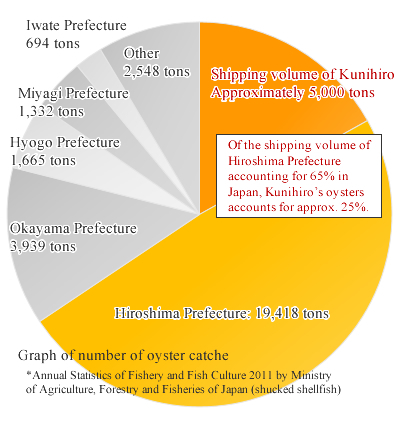 Known as Kunihiro Oysters “safety” and “reliability”. Eating oysters raw is a common dining experience. Kunihiro, a manufacturer handling “raw” materials, is thoroughly particular about safety. On this page, the Kunihiro Oyster manufacturing process and system that maintains quality are introduced. 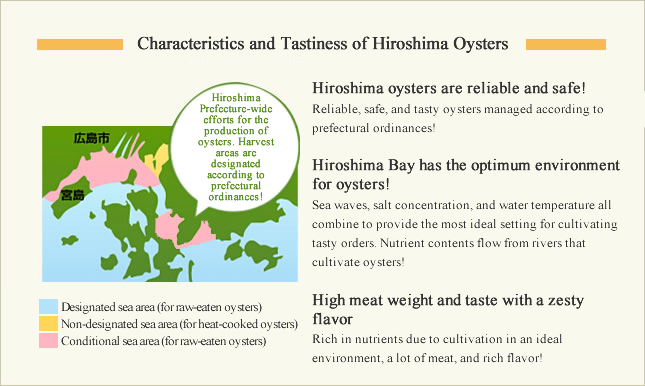 It is said that oysters produced in Hiroshima Prefecture account for 60 percent or more of the oyster volume shipped throughout Japan. With regard to shucked oysters, Kunihiro handles one-fourth of the approximately 5,000 tons of oysters. Kunihiro is unusual in handling such a volume in Japan and its volume is top class (Kunihiro survey). In mail-order sales, we are especially confident in the tastiness of Kunihiro oysters because we only deliver carefully selected oysters of prime quality. We have absolute confidence in quality since we deliver products only of prime quality by checking each one with human eyes. “Quality takes priority over efficiency.” This is the concept of Kunihiro’s method of production. Therefore, all products are strictly selected by skilled workers even now when Kunihiro has top-class shipping volume. We intend to deliver products of prime quality only together with the spirit of Kunihiro which places greater importance on quality than efficiency. To that end, we check each one by human eyes without entrusting such work to machines. We provide true reliability and safety through complete quality management by an advanced inspection system. It’s not surprising that we provide “tastiness.” Kunihiro regards the delivery of “reliability” and “safety” besides tastiness as important to provide products that will please our customers. Noroviruses are detected by using polymerase chain reaction (PCR) assays. Under a situation that only a small number of public organizations can detect noroviruses, Kunihiro quickly introduced the equipment for that purpose. As for “oysters,” top priority is given to safety over all else. Therefore, Kunihiro has established a complete quality management system with the establishment of a “quality management office” to perform receiving inspections and product sampling inspections every day. Self-management inspection is also reinforced with the establishment of a bacteria test room to detect bacteria that causes food poisoning. Shellfish poison inspection is normally conducted using mice. However, food-handling companies cannot breed mice and public organizations take many days for inspection. Kunihiro therefore uses its own “high-performance liquid chromatography” to perform shellfish poison inspection. This is a shellfish poison inspection method developed by Tohoku University to inspect specimens with equipment. The presence of poisons can be inspected with ingredients and displayed graphically. We perform a bacteria test to check whether or not oysters are contaminated with Vibrio parahaemolyticus, salmonella, Staphylococcus aureus, common bacteria, Escherichia coli, or coliform which causes “oyster” food poisoning. The test is performed by material lot and product lot according to the Food Sanitation Law. Freshness means everything for Kunihiro’s products including “raw oysters.” We have established our unique cold-chain system. We make it a policy to ensure delivery of our products at the earliest possible time maintaining a product temperature at 5°C in refrigerators. We deliver products anywhere in Japan from Hokkaido to Okinawa at the requested time according to need.